Today was another one of those days when I decided to work out in the morning and evening. I'm just that dedicated to fitness, what can I say. Let's start with this morning's work out. What happens when you ask your husband to set the alarm clock? He wakes you up 30 minutes earlier than you wanted. While watching the Academy Awards last night (sidebar - I was a little disappointed with James Franco ... he seemed a little TOO out of it) I leaned over and asked Ryan to set his alarm clock for 6:30am since my iPhone was too far away to set my own. He obliged and I drifted off to sleep. This morning he woke me up and after 10 minutes of whining, I finally got out of bed and got ready for the gym. I grabbed my phone on the way out and noticed it said 6:12. WHAAAAAAAAAAAAAAAAT! So I did what any other normal, sleep deprived person would do ... jump back into bed (in gym clothes) for another 15 minutes. Since running this morning wasn't enough to satisfy my exercise craving, I headed over to a hot yoga class at 5:30pm. While in the 1.5 hour class, the power went out due to a terrible storm hitting Charlotte. We finished class by candlelight since the room was pitch black. The traffic lights were all out in the area of town by the yoga studio so kind police officers in bright yellow slickers guided traffic. I managed to safely get home. **sidenote** I've ran 108 miles so far in 2011. I'm well on my way to hitting my goal of 500 miles this year! Don't forget to enter the $15 CSN Stores giveaway (posted earlier this morning)! Early blogging means fun blog posts. I'm very excited to announce my first ever giveaway! The super rad people at CSN are going to give you, one of my readers, $15.00 to spend at one of there 200+ stores. CSN Stores has over 200 online stores where you can find everything from stylish handbags, a L shaped desk, or great cookware! There are so many things you can buy there which makes it that much harder to choose just one thing. If I was lucky enough to win I would probably pick something cooking related for our kitchen. The Flexicado™ Avocado Slicer - Stainless caught my eye and looks like a good tool when making guacamole (yum!). To enter the CSN Store giveaway you must first visit the CSN Stores and tell me what you would buy with your $15.00. Make sure you leave an email address (along with the comment) so I can notify the winner. I'll pick the winner around lunchtime on Wednesday, March 2nd, using Random.org. This is my blogging area. I like to sit in my lovely grey chair from West Elm, with the window slightly open, and play on my computer. It's pretty therapeutic. Sadly its the closest thing to an office that I'll have for a while. At first I was pretty bummed that I didn't run the full 6 miles, but then I realized that I should be happy that I ran at all. I'm a little behind on my training for the half marathon in April, and at this point I'm not sure if I'll be ready for those 13 miles. I guess we'll see how the next few weeks go. I have to give bloggers credit for posting entries multiple times a day ... I can't even manage to post one a day. Work has been a little crazier this week, and quite frankly I haven't had the desire to sit at a computer on my free time after sitting in front of one all day long. So here I am. Finding some time in my day to post a quick recap on this past week. seated leg curl: 3 sets of 12 reps, 35 lbs. seated leg extension: 3 sets of 12 reps, 35lbs. seated leg press: 3 sets of 12 reps, 100 lbs. Later in the day I headed over to Yoga One for some hot yoga. 1.5 hours later I was super sweaty but feeling really stretched out and relaxed. I bought the new student package for $39 (unlimited classes for 30 days) so I'm looking forward to going a lot in the next couple of weeks. This brings us to Friday ... today. As of now I have not worked out, and ultimately would like to do a 6 mile run tomorrow morning, so chances are that I'll skip a work out today. On another note I've been a pescetarian for the past 4 days while Ryan has been out of town on business. The only time I had fish was on Wednesday night when I had some sushi at Deejai Thai with Pablo and Alex. Other than that I have stuck to a vegetarian diet, eating 3 meals a day without any meat. Woo! I took Saturday off from running because I was so incredibly sore from yoga on Friday morning. We spent our Saturday doing a lot of day time drinking at a few of the bars on 7th Ave. (Kennedy's, the Philosopher's Stone, Jackalope Jack's). We didn't want to waste the beautiful day and sat outside for most of the day. For dinner we tried Loco Lime for some tasty Mexican food. A restaurant can never go wrong when serving tacos and queso with chips. We called it an early-ish night since we had a golf game on Sunday morning. I started my Sunday morning with a run around uptown Charlotte. It was gray and windy out, with a temp of around 49 degrees. After I was done showering and eating some quick breakfast it was time to head off to the golf course. We played 18 holes of golf at Rocky River golf club. I really don't have the patience or the skill level to play an entire game of golf; I prefer 9 hole courses. I got bored around hole 16 and called it quits. Ryan and I waited for Pablo and Alex in the clubhouse while they finished up. We didn't have much time to relax at home before it was time to get ready for the Charlotte Bartender's Ball. I had won 2 tickets for the event from a giveaway through the blog The Food Baby. Ryan and I got dressed up in our Sunday best and headed over to the Blake Hotel for some music, food, and drinks. We had a good time and probably drank too much. All in all it was a great weekend spent with some good friends. Glad I managed to get some running in between all of that fun! Well I did it. I got myself motivated yesterday and ran around uptown Charlotte. Three days in a row of solid running has led to some sore legs. Instead of pushing myself too hard this morning with another run I headed to the YMCA for a yoga class. I figured some stretching and deep breathing would help loosen those sore muscles. I was partially right. The yoga instructor this morning believed in doing ashtanga vinyasa yoga. From wikipedia, "A standard viṅyāsa consists (for example) of the flow from caturaṅga, or plank, to caturaṅga daṇḍāsana, or low plank, to ūrdhva mukha śvānāsana or upward-facing dog, to Adho Mukha Svanasana, or downward-facing dog." So basically a lot of plank position and push-ups. My arms were shaking towards the end of the hour long class. We did, however, do some excellent stretching for my hamstrings and hips. Plus I left the class relaxed and peaceful. I'm now sitting on my balcony enjoying some coffee while I blog. Happy Friday my friends. Namaste. Today I'm working the later shift at work so I'm planning on running later this morning. I'm not highly motivated today for some reason. Probably cause I haven't been sleeping well lately. Lots of weird dreams and waking up in the middle of the night because of them. While chatting with Pablo through instant messenger he gave me some advice on my run this morning; what would Pre do? We both really liked the movie on Prefontaine and mention him from time to time when the subject of running is brought up. Well my friends, Pre would run this morning, with or without motivation. I guess I should just do that. I hope there are other people out there that are guilty of ruining "dry clean" only sweaters like me. I don't mean to do it all the time; half of the time I swear it's really accidental. Somehow a sweater always ends up in the hamper and gets tossed in with the rest of the dirty clothes. Sigh. I wish I would stop doing this. The sweater on the right is an extra small GAP sweater. The sweater on the left is also size extra small, but from Banana Republic. At one time both sweaters were very similar in size and style. Now the pretty blue sweater that I only wore a couple of times should belong to an 8 year old. I am so glad I ran 5 miles today. I hadn't run that much since living in Orlando. The half marathon I want to sign up for is in 2 months so at this point I will have to increase my mileage on my long runs by 1 mile every week to get up to 13 miles. "The U.S. National Whitewater Center is the world’s premier outdoor adventure and environmental education center. Situated on roughly 400 acres of woodlands, the USNWC fosters an environment for people to come together to play outside." We decided to do our run for the day on one of the many trails located there. It was my first time "trail running," and I have to admit, it was very hard. The terrain is very uneven and you're constantly on the lookout for roots, branches, or anything else in your way. Not to mention there were parts of the ground that were wet and muddy making it much harder to keep your balance. We finished our first mile in 12 minutes and kept going. Around 1.67 miles (I was keeping track of the distance) into our run Ryan rolled (twisted) his ankle. We walked back to the front of the park and decided to call it a day. By the time we got home (after running a few errands) his ankle was swollen and turning different shades of the rainbow. Gross. Being the trooper that he is, he still got ready for dinner that night as an early Valentine's day celebration. I haven't gotten out of bed before 8am in a long time. I mean a loooooong time. Once I got laid off from my old job I didn't really have to start my day as early as in the past. This morning I jumped out of bed and took Honey out for her morning walk by 7:30am. Usually I hide under the covers and Ryan takes on this responsibility morning after morning, but I think he found my new found energy refreshing. After Honey took care of her business I got ready for the gym. For once the YMCA was only 80% full instead of bursting at the seams like usual. I got on a treadmill and started running while watching "Save my Bath" on HGTV. My legs are still sore from the past week of running so I decided to take it easy and cover the entire screen with a towel so I couldn't see how fast (or slow) I was going. I picked the Taio Cruz radio station on Pandora and increased the speed by 0.1 after every song. 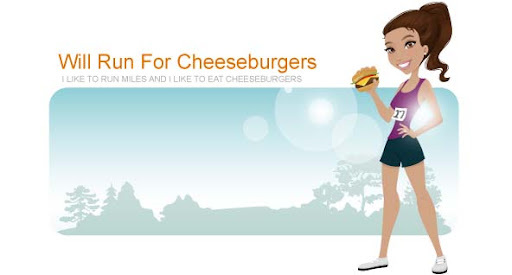 Falafel 5k - May 8: this one just sounds funny. Charlotte RaceFest Half-Marathon and 10k - April 16: Ryan would run the 10k and I would do the half marathon. This gives me roughly 2 months to add some serious mileage to my running. The most I've ran is 4.09 miles since moving to Charlotte back in October. I like planning ahead so hopefully I'll sign up for some (or all) of these races soon. I also found the site for the Charlotte Running Club and am highly intrigued. $20 a year to have other running geeks to hang out with? While possibly eating cheeseburgers? Count me in. This morning Pablo asked me if I needed (or I should say wanted) any caffeine as a mid morning treat. Instantly I thought of a non fat chai latte from Starbucks. When he returned he had in his hand a venti sized drink for me. I'm more of a tall drink order-er since I can never imagine actually finishing more than that. Today I proved myself wrong. I drank the entire thing; all 20 ounces of it. I was so over-caffeinated after drinking all of that chai that I was literally starting to sweat while at my desk. Gross, I know. At least I managed to get 9 grams of protein from it (per the nutrition guide on their website). I skipped the gym this morning and I spent the day beating myself up over it. My legs were just so sore and I couldn't imagine getting any real running in so I decided to just save it for tomorrow morning. When I got home from work I mentioned going to the gym with Ryan and he convinced me that rest is probably a good thing for my legs after pushing them so much the last month. I finally agreed and ended up giving Honey a bath. I think she would've preferred if I would've gone to the YMCA for a run. Stay tuned ... just got word that there might be a giveaway from a very cool store in the near future. It is cold outside; like really cold. I keep thinking that winter is almost over but then remember it is only the first week of February and there is still plenty of winter left. This morning Ryan and I got bundled up and headed outside for a run. It was 32 degrees outside and we managed to run 2.1 miles in approximately 18 minutes (I looked at the clock as we were walking out and when we returned home). I'm glad we got our exercise out of the way for the day and can now concentrate on making delicious snacks for the Superbowl later. Yesterday's run happened on the treadmill at the YMCA. Saturdays are always super crowded at the gym and we had to wait for open treadmills. Once I got on I was determined to do another 4 mile run. Hope everyone is having a good Wednesday! For those of you who were wondering Punxsutawney Phil did not see his shadow so winter should be over. Yay! Yesterday I took the day off from running and did 30 minutes of cardiovascular exercise instead (15 minutes on the elliptical and 15 minutes on the seated bicycle). On Monday I finished off the month of January running 3.25 miles in 30 minutes at the YMCA. The grand total of miles ran in January ended up being 47.38 miles ... not bad for having to run on treadmills most of the time. Today I headed back to the YMCA and ran some miles while watching HGTV (shocker).